When the then-king Gyanendra imposed his authoritarian rule in February 2005 and later clamped down on all private media outlets in Nepal, United We Blog became the go-to site for delivering uncensored political news. One of the two co-founders behind the blog, Dinesh Wagle, a former journalist with Kantipur daily, quit blogging for the site in 2012, after seven years of running it, but still blogs on his personal site. 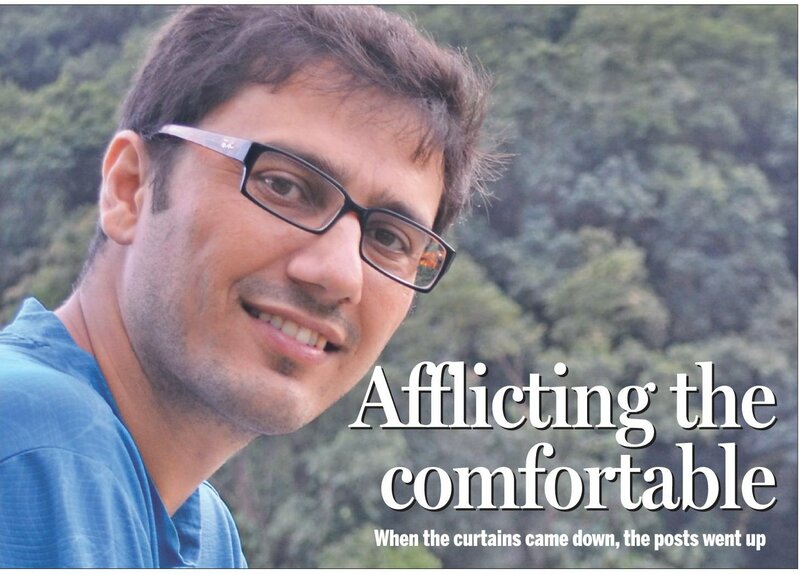 Wagle talked to the Post’s Weena Pun about his days as a journalist/blogger. What has been the difference in your posts before and after the thenking Gyanendra clamped down on freedom of speech? Before the royal coup in February 2005, our posts were mainly about what we did in our daily lives, whom we met and how we felt about the developments in our not-so-public lives. After Gyanendra imposed restrictions on freedom of expression, our blog posts became more political in nature and were aimed at challenging that stifling atmosphere and advocating for the restoration of democracy in Nepal. For us, freedom of expression and independent journalism became a mission. Soldiers patrolling newsrooms to impose censorship was a strange sight for us, and we expressed our dissent on our blog. What is the difference between your work as a blogger and as a journalist? I talked about the limits of space in mainstream media earlier. This limitation (or lack thereof in the blogsphere) certainly makes for some differences in writing. But in both mediums, one writes by keeping the audience in mind, which means an article cannot go on and on just because there is no limit applied to the number of words. As a reporter with magazines and newspapers, I felt most articles were somewhat formal, devoid of certain information that the mainstream press considered too informal. But I liked those bits of information. So I used to write a blog post that included the information that I could not include in a newspaper story. But I always believed, as I do now, that a blog post, like a piece of journalistic work, needs to be factual and truthful. Just because you are the reporter, editor, publisher and owner, as I was of United We Blog at one point, you can’t hit the ‘publish’ button indiscriminately. To be able to publish is a sort of power and with that comes responsibility—which is common to both journalism and blogging. Have you done exclusive stories for your blog that the mainstream press hasn’t covered? Yes. Some were done because the mainstream media was not able to defy the censorship, and we were left to carry those stories on our blog. After the censorship was over, we continued to blog on important political happenings, sometimes well ahead of the mainstream press. Even when blogging became ‘mainstream’ in the Nepali web world, we continued to blog stories from various parts of the country that mainstream media either ignored or didn’t have space to cover. Can you describe a typical day when you were running United We Blog? I was primarily a fulltime journalist with Kantipur daily. But I somehow managed to give about eight to 10 hours a day to blogging during my peak bloggingtime. Mornings began with me moderating comments and responding to some. In the office, the newsroom would be abuzz with political stories. I would go with photographers to cover political rallies for the blog and in between, I’d do some reporting for the newspaper. In the evening, I would edit stories for the paper, look after the Arts page, which I was the chief of, help design it and go home at around nine. In between, I’d maybe upload a blog post or two. At home, I would continue blogging and uploading photos until midnight. Why did you switch to your personal blog? What is the difference between a blog like United We Blog and a personal blog? Because of its popularity, United We Blog became a mainstream outlet in itself. It also became too political. I could no longer post personal entries like I once did. This made me realise that it had become a different forum altogether. The audience was too large and with an interest on issues that were not my daily personal ramblings. That’s why I decided to take my more personal stories onto my own personal site. When Twitter, the microblogging site, is all the rage, are blogs still relevant? Why do people still write blogs? It’s human nature to express and want to express oneself fully. Twitter is a great medium but the limitation of 140 characters is too stifling. An argument, with the full context and necessary background, cannot always be made in 140 characters. That’s why people still blog or read long articles that appear on the Post’s On Saturday. Why didn’t you ever monetise United We Blog? We tried to, occasionally, but it was never my priority to make money off the blog. I was earning a living from my journalistic work and I ran the blog as a hobby. Whatever we earned from displaying some ads on the blog was used to pay for hosting and maintaining the site. KATHMANDU, Feb 13: With the Internet becoming an integral part of urban life in Nepal, online activities have increased significantly expanding the span of Nepali blogosphere. Blogging has been in Nepal for under a decade now and, although early references linked blogs with socio-political implications, contemporary blogs boast a dramatic shift in the range of activities in the blogs and those who post it. Pioneer blogger and journalist Dinesh Wagle (wagle.com.np) started blogging because he was discontent about not being able to express himself in the magazine where he was working. “The magazine, like all mainstream media, wasn´t interested in printing my feelings, frustrations, anger, happiness and sometime unnecessary blabbering. So I thought about creating a forum where I could write about those things,” he said. On this occasion, I want to celebrate the expansion of the social media scene in Nepal with the Post by sharing links to some of my old articles on Internet and social media. These articles originally appeared in the Post and Kantipur. Definitely. Wagle Street Journal has become my usual read. However, one issue I want to point out is lack of those media house to integrate the social media into their mainstream. We are far in time when it is social media generated (crowd sourced) news stream and live stream; plus the print media and broadcast media just go with social statuses of few obvious people – what it forgotten here is the power of Social media to opine, decide, collect, analyze or whatever it takes to make a word into news. Thanks. May be the mainstream media is learning slowly in Nepal.